It's no surprise that exercise and weight loss are among the most common New Years resolutions. Just take a trip to the gym in January and you'll see the masses who have pledged to get fit this year. But after a few months, the newbies start filtering out -- good news for the regulars but not such good news for the fitness of our nation. So what's a person to do? To relieve fitness fatigue consider getting out and having some fun with your pet. Cats and dogs can both benefit from a little extra exercise too. According to a survey conducted by Halo, Purely for Pets*, nearly 89 percent of pet parents want to help their pets get more exercise this year, with the majority (62.4 percent) planning more walks and 68.3 percent committing to play with their pets more often. Finding a new game to play (30.3 percent) -- Try fetching or tossing games. We particularly enjoy tossing a Jolly Ball or the Booda Floppy Disc. Both come in several sizes so you can choose the right size for your dog. Go to the dog park more often (20.2 percent) -- Check out this dog park guide from dogpark.com. Run my cat up and down stairs (15.8 percent) -- We don't have a cat in our household, but Cosmo spends a lot of time running up and down stairs looking for his favorite toys! Also making the list was taking a Doga class and getting into extreme sports. Here are a few more suggestions for fun activities you can do with your dog. Take an agility class -- you don't need to have aspirations of competing to benefit from the mental stimulation and physical exercise for both you and your dog. To find a class near you, check your local listings of search these agility clubs from the AKC and USDAA, two of the several organizations that sanction agility trials. 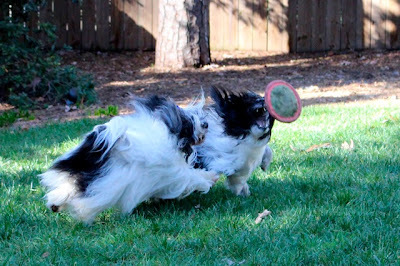 If agility sounds too strenuous, try rally -- rally is a great stepping stone to agility or obedience, but again you don't need to compete to enjoy taking a class and getting up off the sofa! Check your local listings for clubs or this list of training clubs from the AKC. My New Year's resolution? Continue to have fun with pets in 2012! *In a survey conducted during December 12 - 23, 2011, Halo, Purely for Pets surveyed more than 1,000 pet parents to find out their New Year's Resolutions. Fred and Gloria give me a reason to get out and get moving. Walking them helps keep me motivated. Have a Happy New Year! Oo good tips! Happy New Year!